Here at Banting House, we have rotating displays in the Frances Ruth Lawson Gallery to showcase different aspects of the history of Frederick Banting and diabetes. This moving gallery is a chance to be inventive in how we explore history. Our current exhibit is no exception, and has quickly become one of my favourite rooms to browse through. The gallery currently showcases Banting’s story through three different comics, and it’s a really fun and creative way to see his story brought to life. As someone who is interested in how history is portrayed in the media and in popular fiction, I love seeing how this prominent Canadian figure has his story expressed in three different ways. Each comic is from a different time period, and reflects the public perception of Banting at the time, as well as the knowledge that we have continued to acquire about him. It’s a testament to how understandings of history shift over time, from an outright heroic retelling of his life (drawn by a superhero comic artist no less!) to a more serious version of his story in the present day. 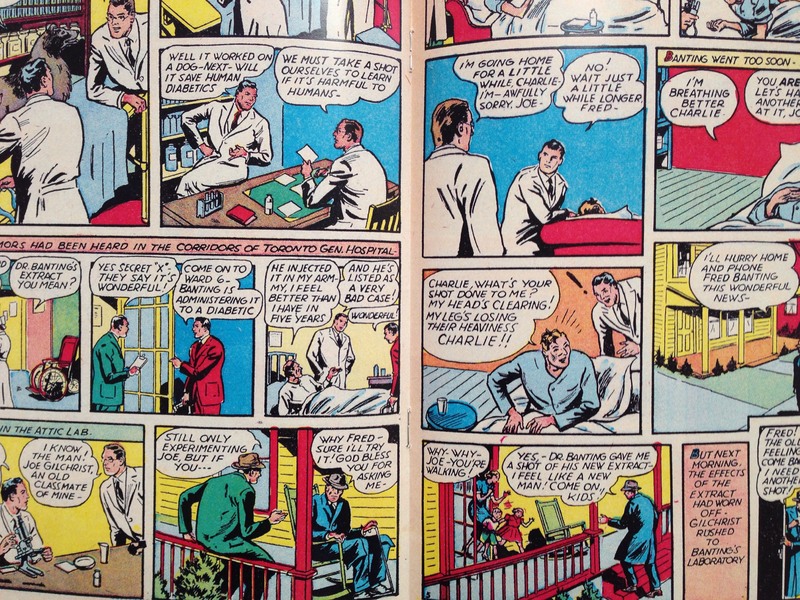 The comic from the World Famous Heroes Magazine presents Frederick Banting as something of an unstoppable hero, who survived the war and skyrocketed to prominence with his discovery of insulin. It was published before any official biographies were, and places him among famous American icons. The comic is fast paced and highlights the miracle of insulin. World Famous Heroes Magazine recounts Banting’s discovery and development of insulin. This is in contrast to the last comic, Duty Must Be Done: The Story of Frederick Banting by Diana Tamblyn, which is a more subdued retelling of his story, acknowledging Banting’s reservations about being held up as a heroic symbol for his discovery. Both this comic and “The Giants” were influenced by later biographies and research into his life. The last page of Tamblyn’s comic shows Banting House National Historic Site of Canada, focusing on his statue and the Flame of Hope, ending with the significance of his impact on diabetes research world wide. I encourage everyone to take time to look through the current exhibit while visiting Banting House! It’s a fun way to immerse yourself in his story as you explore the museum, and an interesting look at how perceptions of historical figures and events can change over time. My work at Banting House this week also has a lot to do with how he has been remembered, as I continue to organize the collections in the Seneshen Gallery. This gallery is home to two plaques commemorating Banting’s discovery, one of which is the original plaque placed at Banting House on October 30, 1970 by the London Public Library. This was during what they thought was the 50th anniversary of the idea that lead to the discovery of insulin. October 31st was later recognized as the true date, as Banting had the idea that would lead to insulin early that morning. This shows the ways in which our understandings of history can change even in a small way, and the plaque remains as a part of Banting House’s history of recognizing the significance of the site. It was unveiled by Lady Henrietta Banting during the ceremony, providing a personal connection to his history as well. One of the main items I’ve been working with this week is the guestbook from Her Majesty Queen Elizabeth, The Queen Mother’s visit in 1989. I was able to take it out of its display case to work closely with it in order to enter it into our PastPerfect system, and it’s been a lot of fun to look through it and see not only the visitors during the Royal Visit, but the people who have come since then. The Royal Visit signaled the lighting of the Flame of Hope and the unveiling of the life-size statue of Dr. Banting, and the importance of Banting House to diabetes research.